Adjustable height from 33" - 37"
The Folding Travel Canes by Mountain Properties are made of a strong, lightweight aluminum cane with solid maple wood handle and durable rubber tip. 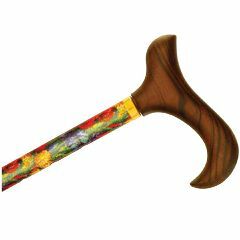 Canes are adaptive equipment that promote independence and assist with improving balance while walking. Slimlines have a derby style handle sized for a women's smaller hand. They are adjustable from 33-37" in one inch increments and fold into a compact 11" x 5" plastic carry case (included). 175 lb weight capacity. Great, light weight, travels well. Comes in handy when I walk on rough or uneven ground. The handle grip is comfortable and the center of gravity is great. Anyone can use this cane. OK on muddy ground? OK on city sidewalks? How long will delivery take? Returnable? I am very pleased with my cane. I have have been stopped in stores and asked where did I get the cane. One has to use it like anyother cane, know your limits. I haven't had any problems on any surfaces with mine. The only problem I have had it doesn't fold completely down any more after a month of use. I am using this cane that is at least 20 years old, and just bought the same new one that looks better. The grip is comfortable, the center in gravity is great. I can fold it down when I need to (on an airplane to Europe) light weight, easy to use!